The AWT Cure-Tex Textile Dryer is an infra-red conveyer dryer that offers a lower-cost alternative to larger dryers of its kind. Designed for maximum production speeds, it features heavy-duty chamber insulation for even, efficient heat delivery. This prevents scorching of garments while minimizing energy consumption. A full control panel provides up-front settings for adjusting temperature and conveyor speed. Built to last, the Cure-Tex Infra-Red Conveyer Dryer is designed for easy access to all components. The optional Cure-Tex Cap Panel adds an internal infra-red heating panel to one side of the dryer to allow for additional direct heating. This is useful for curing items such as hats or other three-dimensional items that have printing on the side. The smaller unit has an 18" (46 cm) wide conveyor and is 58½" (149 cm) long × 28" (71 cm) wide. Shipping weight is 250 lb (113 kg). 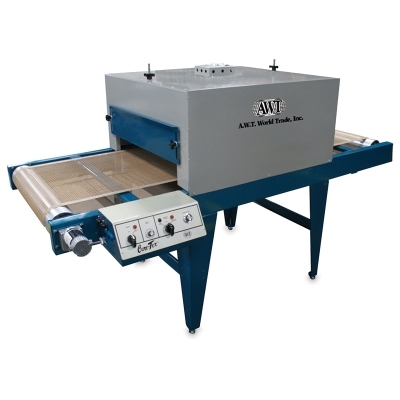 The larger unit has a 24" (61 cm) wide conveyor and is 84" (213 cm) long × 38" (99 cm) wide. Shipping weight is 500 lb (227 kg). ® AWT is a registered trademark.™ Cure-Tex is a trademark.